My son is very playful for a 1-year-old, but he has become quite irritable. He was just about 3 weeks old when his skin turned yellow. It did not fade and I thought he just needed some sunlight. I was not worried and never thought it was something serious. 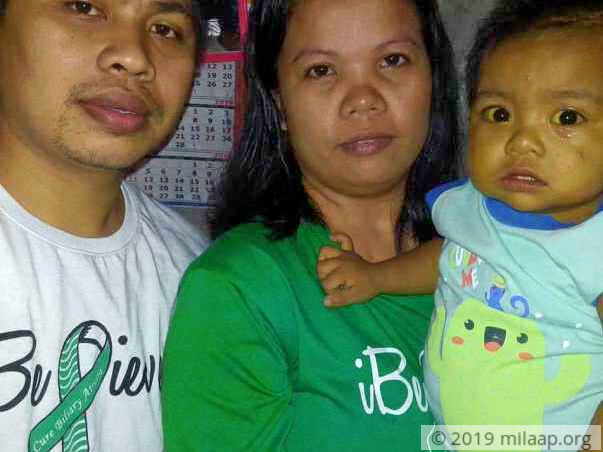 I was never aware of a condition called biliary atresia. After 2 months, we decided to bring him to a doctor. He was on medications for one week and under observation. Even after the course, his jaundice did not subside. It was April 11th, 2017, when he had his first ultrasound. 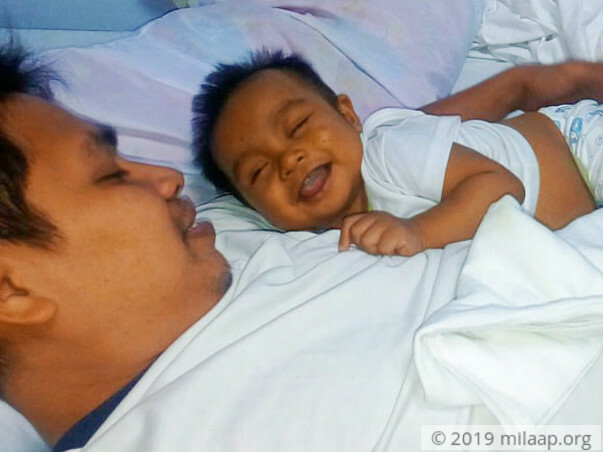 The result told us definitively that Nicell has biliary atresia. Until then we had no clue. We live in the province, and we were referred to Manila for treatment. My husband, Telly, works in Manila, so we were able to come and consult a doctor. 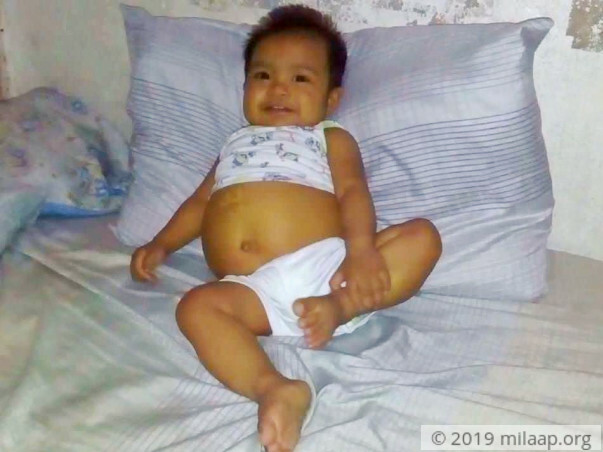 Nicell was 3 months and 10 days old when we admitted him for a possible Kasai procedure. The operation did happen as scheduled because he contracted pneumonia. Finally after 2 weeks, when they wheeled him into the OT, they discovered that his liver was cirrhotic and Kasai would not help anymore. The words we heard after this, broke our world. His doctor said that the only option for him to survive is liver transplant which costs 5 million pesos here in the Philippines. She also said that the cheapest is in India. My husband is a delivery driver making 500 pesos/day. We had to leave our 3-year-old daughter back in the province as we could not afford to care for her here in Manila. I do not know how we can get Nicell through this. There are times I wish this was all a long bad nightmare, especially whenever Nicell has to be admitted to the hospital with complications. He is a fighter, my baby boy, but still, how much can he take. He screams in pain every time I force him to take his meds. Yes, he has a bulging belly. In the last 6 months, he needed draining 4 times for fluid retention. The maximum sleep he gets is about 3-4 hours a day. I wish we could leave for India and save him from this pain. We just lack the funds. Telly will donate his liver. We are both doing everything we can to care for him, raise funds. Somehow, we still fall short. 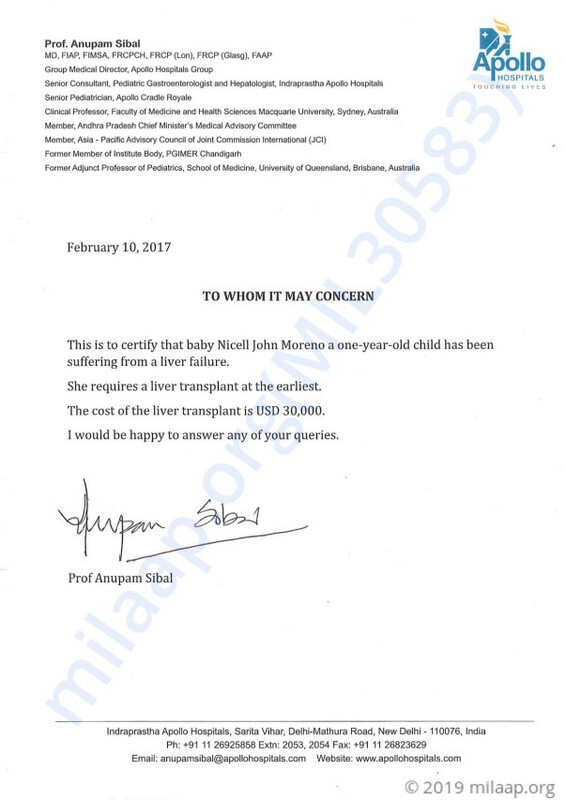 We promised our baby a beautiful life, and I need your help to make sure he gets to live. Get well soon baby boy. Hope you have a beautiful life ahead and make your loving parents proud.